Meenoo Mishra is a Senior Public Health Analyst in The Cloudburst Group’s Public Health practice area. She serves as the technical lead on projects with the Centers for Disease Control (CDC), such as evaluation of STD clinical partnerships with the Division of STD Prevention and partnership development and engagement with the National Center for Injury Control and Prevention. 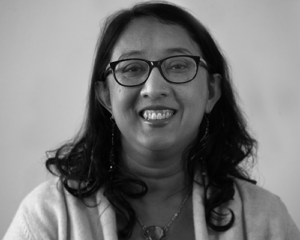 Ms. Mishra has over seventeen years of experience in partnership engagement, evaluation, policy development and analysis, technical assistance, and knowledge of health equity/health disparities and social determinants of health to promote health equity for underserved communities. Before Cloudburst, Ms. Mishra worked as an independent consultant where she specialized in health communications and research support for organizations and agencies working to promote health equity and healthy communities. Prior to her work as an independent consultant, she managed the Association of State and Territorial Health Officials’ health equity program, where she promoted health equity through organizational and national policy and position statements, the Health Equity/Minority Health Survey, and several state and affiliate policy working groups. She also worked as a contractor for CDC in HIV/AIDS and chronic disease in underserved populations. In addition, Ms. Mishra has experience in behavioral health evaluation. Ms. Mishra received her MPH in behavioral sciences and health education from Emory University and her BA in anthropology and history from Case Western Reserve University.